It takes a village—of runners. 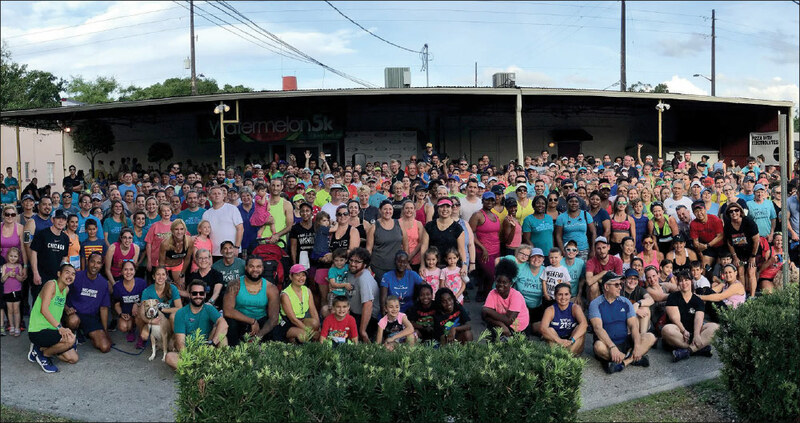 Track Shack’s annual Global Running Day event drew 300 participants for the Orlando, FL-based store’s free run. Any growth in retail for the past several years all seems to flow to one place: Amazon, the world’s most valuable company. For the rest, it’s been the “retail apocalypse,” a term coined as shorthand for the Amazon-inflicted carnage that’s the supposed root of high-profile bankruptcies spanning Sears, Nine West, Payless, Bon Ton, The Walking Company… The list—regardless of size, format or longevity—is bloody and long. Amidst all the doomsaying, however, there are very real signs that brick-and-mortar retailers cannot just survive, but use their local ties and experiential attributes to thrive. “It’s definitely a super-competitive environment, no doubt, but what’s interesting to me is if you are positioned in a niche market, people are winning there,” says Barbara E. Kahn, a professor at the University of Pennsylvania’s Wharton School of Business and author of The Shopping Revolution: How Successful Retailers Win Customers in an Era of Endless Disruption. For their part, many footwear retailers have been holding their own, with specialty tier revenue in the U.S. posting a positive, if modest, 1 percent gain, over the past five years to a total of $39 billion in 2018, according to IBISWorld, a market research firm. There is hope for even retaking ground Amazon has won, Kahn adds, pointing to the reemergence of the local bookstore. From 2009 through 2017, the number of independent bookstores rose 40 percent, according to an American Booksellers Association report. That’s the very business Amazon targeted at its founding—if it can rebound, so can others. What will it take to press the shop local advantage? It’s been repeated innumerable times since Harold Samuel first coined the phrase that the three keys to retail are “location, location, location,” but not anymore. Where you are still matters, of course, but the days in which the choice of street corner was the most consequential decision a retailer would make are over. For starters, there’s an ‘Everything Store’ and many others worldwide are a click or two away no matter where consumers are. A unique selection and an experience as well as community engagement are more important than a specific location. In Track Shack’s case, it starts with targeting serious runners with best-in-clsss advice, fit and selection and extending those methods through to all levels. Hughes says the store has really elevated its gait analysis to “almost a science” and staff can confidently advise on nutrition approaches ahead of a long run or refer customers to a local physical therapist. “That extra step is the understanding and connection and shared passion for the sport,” Hughes explains. Track Shack projects its expertise and community involvement by operating more than a dozen road races, including the Walt Disney Marathon. Hughes’ father, Track Shack cofounder Jon Hughes, suggested the race in the ’90s when the theme park operator was seeking new ways to draw crowds. Today, marathon weekend draws 85,000 runners for four races (plus kids’ races) and an expo anchored by Track Shack. “Whether you’re going to focus on hiking boots, luxury shoes or children’s shoes—you really have to have a niche expertise, you really have to be the best. It’s not enough just to pay lip service,” says Kahn. It’s not just athletic dealers who can provide a core niche. Beck’s Shoes, a 9-store chain in California, anchors itself with a focus on the Bay Area’s large—and time-pressed—tech community. For instance, employees at a local Panasonic factory need to wear electrostatic dissipative work shoes. Beck’s periodically sends one of three outfitted trucks carrying 1,000 pair of inventory to its offices so employees can easily shop for the specialized footwear. Trucks also make their way to medical campuses to offer shoes preferred by hospital staff. “We have the right products and sell a lot of shoes off those trucks in northern California and Nevada,” says Adam A. Beck, CEO. He also sends staff to participate at Apple and Google employee fairs, distributing $20 vouchers to use in any Beck’s location, with no additional purchase required. While Amazon invests billions into drone delivery and package lockers, it still can’t make up for having a true local presence. But making a connection in the community has to go beyond the exhortation to skip shopping greedy Amazon, says Kris Hartner, owner of Naperville Running Company, in Naperville, IL. “You can get just about 95 percent of the shoes we carry online or at literally 12 other places in Naperville,” he says. “We need to offer a lot more.” A common strategy for specialty running retailers is to organize regular running groups, something that Hartner does. Yet that can’t be the only effort to connect with customers, he advises. Back-of-the-envelope math says a single store operator probably needs annual turnover of $700,000, of which about 70 percent will come from shoes, or about 5,000 pairs. “If you have 200 people in your group, they may buy three pairs each a year. That’s great—that’s 600 pair—but what about the other 4,400? You need multiple little pieces that add up,” he explains. Hartner has found over his 19 years in business the Naperville Running Co. has been able to weave itself into the fabric of the city of 150,000 people by sitting on boards for the chamber of commerce and the historic downtown commission and encouraging staff to also perform community-focused activities—there are seven company employees who also coach sports in Naperville, for instance. They also collect gently used sneakers from customers to donate through Share Your Soles, which distributes shoes to the needy worldwide. Comfort One secures deals with European footwear makers for custom-made shoes or inks agreements for regional exclusives. From there, Breton, who founded the company 25 years ago, constantly evaluates merchandise assortments and ranges to emphasize better-performing products. On top of uniqueness, Comfort One plays off web retailers’ weaknesses. “People like to try shoes on and the return game is difficult for online retailers, so we make it as easy as possible,” he says. The chain has a satisfaction guarantee, allowing customers to return shoes under any circumstance in any time frame. Beyond selection, local retailers must also be convenient, says WhizBang! Retail Training’s Bob Negen, a consultant and long-time shop owner. That means, for example, matching shopping hours for the nearest mall and operating on Sundays, when 15 percent of sales are typically made, according to Negen. And despite the desire of many shoppers to buy local, retailers won’t get a pass on execution. Kahn’s research finds that retailers need to be performing in four quadrants: competitive pricing, frictionless shopping, customer experience and brand. Even admitting that Amazon has triumphed in crafting a low friction customer experience and Walmart has a lockhold on low pricing, retailers still need to pace themselves against the benchmarks those companies set. “If you’re out of whack with what people consider fair, they’re not going to come to you,” Kahn says. In the meantime, there are always ways to up the experiential element without going broke in the process. Kahn points to Allbirds as an example of incorporating subtle experiences in its flagships in London, New York and San Francisco. The brand tweaked the layout so a salesperson accessing the stock is never out of view of the customer they’re helping, while the chairs pivot forward slightly to make trying on shoes easier. “Those are two little examples that show they’re really focusing on the customer experience,” Kahn says. The company also promotes the fact that it’s a B Corporation, a designation meaning the business must consider its environmental and societal impact in decisions. That ticks the ethos box Millennials look for, while its shoes hit on the all-important comfort, wellness and athleisure attributes. With a mix of freestanding locations, strip mall storefronts and trucks, Beck’s Shoes devotes a lot of time to creating consistency of experience, notes CEO Beck. The chain builds off a focus on engaging the senses—without investing millions. This ranges from distributing a leather smell through HVAC systems to lining store walls with a timeline of the chain’s 100-year, family-owned history. Video monitors reinforce the family connection between educational segments on foot health. The chain also has its own playlist in each store covering music popular through the length of five generations of family ownership. A final piece to making a local store a destination of choice for customers is a strong commitment to employee recruitment, engagement and retention. The keys: hire right and train a lot. Some, like Naperville’s Hartner, start by feel with finding “super-nice” personalities that will focus on the customer regardless of experience, and then reinforce with training and written manuals over time. Others like Beck’s Shoes recruit more formally and on a continuing basis. Beck’s formalizes much of its employee behavior from the start, including an eight-step store “basics,” which includes greeting and giving a store tour to every customer and making sure they point out at least one $5 non-core item in the shop. “Once you stop giving a customer experience in a store, you start going backwards and getting bad Yelp reviews. And bad reviews are like a cancer,” says Beck. In both cases, Hartner and Beck say providing good pay and benefits to employees with an eye toward retaining people for the long term is key. “A critical part of this is taking care of the employees, and that’s my number-one focus,” says Hartner. Even as 90 percent of retail sales still occur through brick-and-mortar, retailers can’t take those inherent advantages for granted. According to Gartner Group’s “Predicts 2019” report on retail, web retailers are expanding into physical locations, combining web- and street-commerce as much as possible, and maximize sales through constant price tweaks and data mining their customers. This means consumer expectations for convenience and selection are going to increase. Experts predict that what makes a local store unique—selection, service and experience—will become even more critical to survival. It’s the best avenue for differentiation. Take Finish Line’s recent experiment of converting a bunch of running specialty stores under its homogenized JackRabbit banner. Once the very aspects that made those specialty stores special—deep local roots, run by original owners and offering expert service—were largely taken out of the equation, many lost their way. To win at local, one must be truly local. That connection with consumers must be made. Because, if not, they have plenty of other (generic) options, starting with the Everything Store.